Det Stora Oväsendet is the second full length album from Dard Å Ranj Från Det Hebbershålska Samfundet, a Swedish group comprising Michel Isorinne and Varg whose previous releases between them straddle electronic, experimental and dance music. Released on Glasgow's Clan Destine Records, Det Stora Oväsendet is concerned with the 17th century Swedish witch hunt and other acts of heresy. 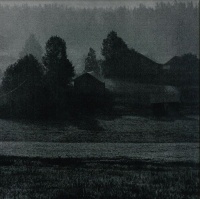 Despite its theme Det Stora Oväsendet isn't really an album of ritual occultism or Swedish death metal, though I'd suggest elements of both can be detected in the overall sound and theme of the album which draws upon Swedish culture and history. Instead the whole album is filtered through grainy hues where dark ambient, retro synth work and abstract techno beats come together shrouded in droning and dark atmospherics. The opening and closing pieces reference the years of the Swedish witch hunt, a time of hysteria when hundreds were accused and persecuted for taking children to fraternise with Satan in what became known as Det Stora Oväsendet (the great noise). Those tracks act as little cinematic themes with the chiming keyboards of '1668' riddled with industrial skreechiness and hollow thuds while the closing track, '1676' plays out to spacey cosmic tones. The rest of the album is rendered through dirty, grainy dark ambient murk with some tracks absorbing abstract dance rhythms. One of the earlier tracks 'Hærsi' is awash with shifting layers of distorted drone underpinned by looped, wavering dub beats. It drifts along for some time before the textures and clipped beats convene to whip up something of a storm sucking up further layers of analogue noise. Merging beats, drone and noise it is something of a portent of what's to come. Although there's not a lyrical narrative to Det Stora Oväsendet, some of the tracks reference the key protagonists of the witch hysteria that afflicted 17th century Sweden. 'Johan Grijs' was a young boy better known as Gävle-Boy, responsible for telling tales about witchcraft and of abduction where children were lead to Blockula, an infamous place in Swedish folklore where the Devil presided over the Witches Sabbath. On Det Stora Oväsendet his story is told through rampant drumming punctuated by screechy tones surrounded by whooshing and shredded noise. 'Rumpare Malin' tells of Malin Matsdotter, who was one of Sweden's most famous alleged witches who unusual to Swedish tradition was burned alive. Here anguished moans are worked through dark droning over heavy thudding timbres, light glistening tones and fractured rhythms. With its hand rhythms and echoed drones, 'Satans Illusioner' suggests a more prevalent pagan/shamanistic feel to the witchy business that precedes it but Det Stora Oväsendet is really about drones, vintage synths, beats and low key rhythms and they really come to the fore on 'Tobohäxan På Ramunderberget', the opening track on the flipside, where a tinkering dance rhythm and low end bass tones accompany the light airy synth tones. Even here, though, you can detect the underlying drones that are pivotal to Det Stora Oväsendet. On 'Katarina Bure' retro synth sounds are performed in a loose improvised fashion over analogue squiggles accompanied by chiming processed hand bells. Dard Å Ranj Från Det Hebbershålska Samfundet follow a long lineage of Swedish industrial and dark electronics and I'm thinking here specifically of the Cold Meat Industry label. But Det Stora Oväsendet also draws comparisons with Ghost Box and particularly The Focus Group for its retro-nostalgia synth sounds and with its fractured dance beats and fascination with witchcraft Demdike Stare are an obvious comparison. Det Stora Oväsendet is quite understated but it has its moments even if the abiding theme isn't always obvious. Dark industrialists and black metallers - who can cope with rhythms - will find the dark drones of D.Å.R.F.D.H.S. suitably immersive.